Stop going cragging. It’s an inefficient and overly-elaborate process if your primary goal when heading to the cliff is to improve as a climber. Choosing an area that suits both partners, then sorting and re-sorting gear, and dealing with the myriad changes in belayers, shoes, and climbing locations all take up huge amounts of time and energy, and produce nothing of value in terms of training. 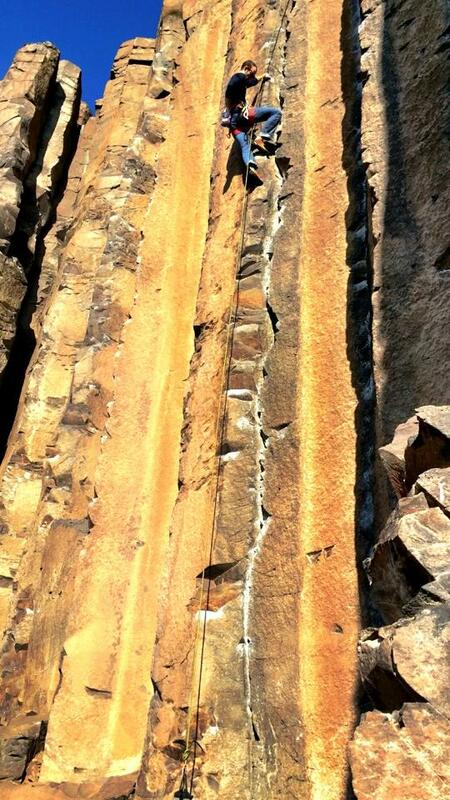 Traditional partnered cragging results in a lot of “down time” for everyone. And while that down time is desirable if climbers are spending their day attempting pitches near their physical limit, it is absolutely an undesirable outcome if you are trying to gain endurance, maximize your vertical mileage, or learn the intricacies of a pitch without boring your belayer to death. The better option, if you are trying to maximize your time spent actually climbing and learning, is to borrow a technique from experienced rock wizards like Mikey Schaefer and Justin Sjong. Learn to toprope solo. 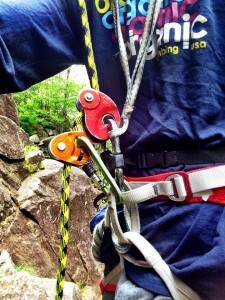 Leave your normal belayer behind, and team up with the best partner money can buy. Plus, your Mini Traxion won’t bail on you or complain that your feet stink. Toprope soloing is the process of climbing along the length of a fixed rope (either static or dynamic) and using a pre-rigged mechanical device to arrest your fall. Whichever device you choose, it is clipped both to your harness and to the rope, often with a backup or duplicate device. There many setup variations, which I will detail in a followup article, but the basic idea is to use a device which will only travel in one direction along the rope. Even if you do come to the crag with a (human) partner, you will both be able to get in far more climbing if you both bring the necessary equipment for solo toproping, and simply climb alongside each other on adjacent routes. And on days when you couldn’t round up a partner at all, going soloing on a rope is the only option to gain some mileage and keep improving. Just bear in mind that despite not having a human partner, you are still toproping, so please give priority to anyone actually seeking to lead. Winter is a perfect time to use toprope solo setup, because the days are short and cold, making continuous movement an appealing prospect. You’ll stay far warmer than you would have if you were trading leads and belays. And the crags are frequently less crowded that during summer, making it a good time to fix ropes on a few adjacent pitches without intruding on others. Many serious climbers take winter, especially later winter, as a time to build up endurance and mileage. This training phase, which lends itself perfectly to TR solo climbing, comes after the end of fall season and a “power peak” with crisp autumn conditions conducive to cruxy redpoints or bouldering projects. Endurance climbing often involves long “ARC” (Aerobic Respiration and Capillarity) sessions in a gym, where the climber intentionally maintains a pump and climbs despite fatigue for 20-40 minute intervals. This proven training technique is ideal for auto-belays indoors, TR soloing outside, and permanently quashing a partnership if you ask for a belay from a real human. A toprope solo setup is also an excellent way to get in your swings on the PNW’s ephemeral ice lines, and to re-learn the flow of climbing with tools and crampons in a low-stress environment. Canadian ice guru Will Gadd suggests that one needs to have followed 50 pitches of steep ice before leading vertical ice safely and efficiently. Without prolonged access to steep and protectable ice of other regions, using a solo setup is a great way to get in tune during our early ice season, and to work up toward those 50 pitches. Not having a belayer under you also allows you to climb without endangering another person by having them in range of falling and flying ice debris. Furthermore, ice is seldom steeper than vertical and its routes typically don’t have the long and wandery traverses found on some rock climbs, both traits that make ice an ideal medium for toprope soloing. Since it often allows for many hands-free stances and results in a slower and more static climbing style than on rock, it is ideal for working out the bugs in your soloing system, including tying backup knots and working rope through your chosen device. In addition to training endurance, toprope soloing is also a fantastic way to practice and learn technique on balancy pitches and very difficult cruxes, even if a high-mileage day isn’t your goal. While working his way through redpoint ascents of all the major routes on Index’s Upper Town Wall, Mikey Schaefer chose the top-down TR solo approach on nearly every line. Without a bored partner keeping him on belay, he was free to spend long amounts of time studying tiny intricacies and subtle position changes that characterize hyper-technical granite climbing. And despite the impressive stature of the Index Upper Town Wall, even the longest routes on the formation are just under 200m, easily fixed with 3 standard ropes. I hope that after reading this far, you’ve been convinced why to toprope solo. In the next few weeks I’ll be sharing some of the where and how to toprope solo. I’ll be going through deal locations for solo toproping cliffs and ice lines in the northwest, and the pros and cons of different rigging systems. Super looking forward to it, especially to more ideas for rock and ice routes with decent walkaround access for setting up. Really looking forward to this. Coming from an endurance background this type of training makes a lot of sense to me and I have always done it with auto belays in the gym. It will be great to expand my tool kit for running laps on real rock. I believe Will Gadd claims 150 pitches at a minimum, not 50. Agree with all but the statement “…you are still toproping, so please give priority to anyone actually seeking to lead.” If I’m there first, I climb first. I won’t lap the climb like I perhaps wanted to, but I sure as hell won’t take my setup down that I just spent time putting up. You can wait your turn.